According to Swedish law, there is a two weeks open purchase when using Internet. However, we do no accept returns for jewellery with personal engravings or for special orders. 1. Print and fill out this Returns form and include same in your return package. 3. As soon as we have received your return, we will check same and send a confirmation via e-mail. We will not pay for the return postage and note that you are responsible for the delivery. REFUND OF PAYMENT BY CREDITCARD, DIRECT TRANSFER VIA YOUR INTERNET BANK. been received by us. When we have accepted a return (via e-mail), we will reimburse the amount immediately and we will notice you by e-mail. You will see the refund being credited your account within a couple of days, refunds by direct bank payments will be registered immediately on your bank account. Please note that a refund is only valid for the product (not freight or invoice fee if you have paid an invoice). The goods must be returned in same condition as it was when received. 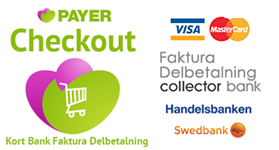 REFUND OF INVOICE (BUYING AGAINST INVOICE AND MAKING A DOWN PAYMENT) N.B Only for Swedish customers! Having paid your invoice but regretting your purchase, you will have a balance in your favour with Collector Bank. For a reimbursement, Collector Bank will need your address and information of your account, (they are not storing this information because of your payment). E-mail your information to contactcenter@collector.se or call 010-1610100. We also accept your desire to exchange the jewellery you ordered within two weeks, providing it is in same condition as when it was sent. We do not accept change of engraved or specially made-up jewellery. Fill out this Returns form and include same in your return package. As soon as received we will e-mail you a confirmation of receipt together with eventual payment instruction if there is a difference in price. If the piece of jewellery you want is cheaper we will refund you as shown above. Please note that we do not cover the cost for the return and also that you are responsible for the shipment. Welcome to contact magdalena@m925 for eventual returns.